95.9 The Ranch knows that we have A LOT of talent here in Fort Worth, and we want to give you a chance to prove yourself! 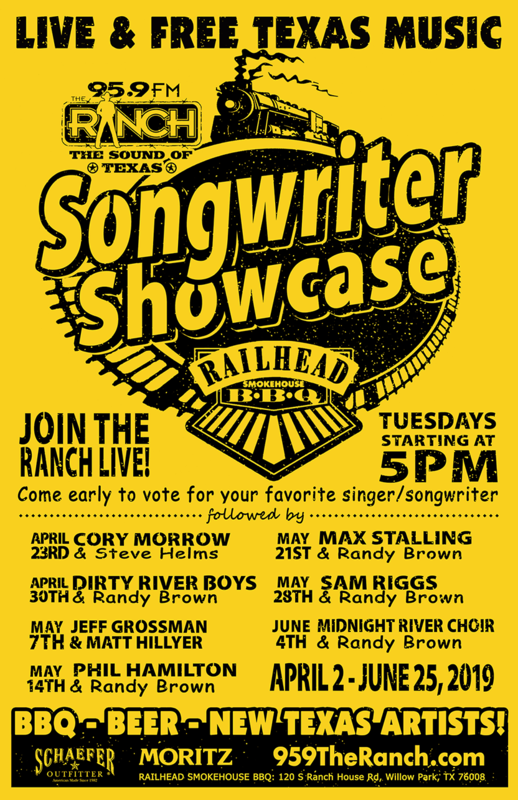 If you are an aspiring musician we invite you to register for the Ranch’s Songwriter Showcase, starting April 2nd and every Tuesday till June 25th! Next up this Tuesday, April 23rd – Josh Langston, Tanner Usrey, and John Dempsy! Followed by a free performance from Cory Morrow & Steve Helms! 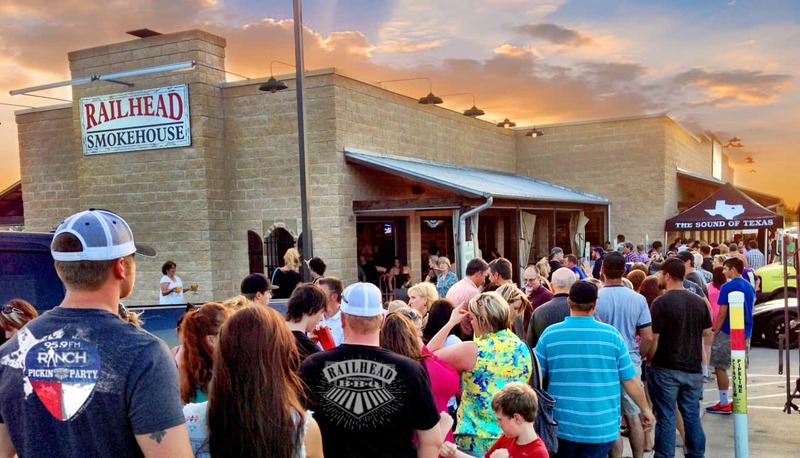 Each week, we’ll invite 3 contestants to join the Ranch for a song swap on the patio of the Railhead Smokehouse in Willow Park. At the end of the night, a winner will be crowned and given the opportunity to be the acoustic opening act at the following weeks Ranch Music Series! 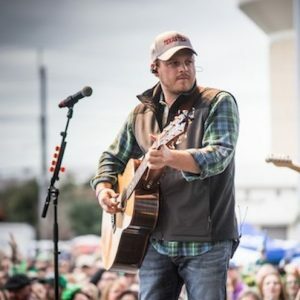 On June 25th, week 13, all the past weekly champions will get to compete to win a 1 on 1 sit down songwriting session with Texas Country stars Josh Abbott and Wade Bowen! Who knows, your song just might be the next big hit! To compete, fill out the below form, GOOD LUCK! Following the competition each night, stick around for the free live Texas Music! NO PURCHASE NECESSARY. Open to legal residents of the United States. Employees and Directors of KFWR, 95.9 The Ranch, The Railhead Smokehouse in Willow Park, their affiliated companies, participating Sponsors, information providers, content providers, subsidiaries, advertisers, advertising agencies, promotional and marketing agencies (and their immediate family members and those living in the same households) are ineligible. By participating, you agree to these Official Rules and to the decisions of the judges, which are final and binding in all respects. KFWR, 95.9 The Ranch will extend 3 invitations per week regarding participation. By accepting, participants are granting 95.9 The Ranch and Sponsors all rights regarding all photos, videos, and recordings submitted or taken in relation to the Ranch Factor competition for all media purposes. On week 13, June 25, the 12 previous weekly winners will be invited to perform 2 songs for the panel of judges (TBD). At the end of the night, 1 contestant will be announced the winner and receive the Grand Prize. By accepting a prize, winner(s) release and discharge all sponsors, affiliated companies and their parents, subsidiaries, advertising and promotion agencies, and all their respective employees, officers, directors, representatives and agents from any liability or damage due in whole or in part to the award, acceptance, possession, use or misuse of any prize or from participation in this contest. By participating in this contest, any and all semi-finalists and winners, except where prohibited by law, grant KFWR, 95.9 The Ranch and all other sponsors the right to use the winners name, likeness, picture, portrait, hometown, voice, biographical information, written submissions and written or oral statements, for advertising and promotional purposes without additional compensation. KFWR, 95.9 The Ranch and The Railhead Smokehouse in Willow Park, and any parties affiliated with them, are not responsible for any error in registration and or in the voting process. All decisions on prizes and winners are final and are not subject to review based on allegations of voting error, improper voting, and/or level of attendance during time of performance. KFWR, 95.9 The Ranch and The Railhead Smokehouse in Willow Park reserve the right to refuse anyone entrance into this contest. KFWR, 95.9 The Ranch will have the final say as to who the winner is. Contest will last 13 weeks. The winner will have the opportunity to perform an acoustic set at the Ranch Texas Music Series at Lola’s Trailer Park. The performance will take place Wednesday of the week following their win.